Blue Multi-Color Butterfly stained glass. 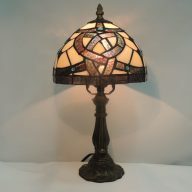 This tiffany style butterfly blue multi-color memory lamp would make a perfect gift of light for any occasion. 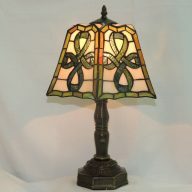 The outer edge of the stained glass wings are aqua, and below that, a narrow band of whitish blue blue flows through this copper foil stained glass shade lamp. A wider band of sky blue is next, along with six cabochons of various sizes going from the top of each wing to it’s bottom. The cabochons are red, green, and blue and are surrounded by different colored circles of green, white, orange and light blue. The beautiful stained glass wings show off a wide band of multi-shaded green, finally ending with light blue and bluish green next to the eyes. The eyes are red cabochons. The color combination on this memory lamp is quite mesmerizing. The butterfly has a resin base and sits on top of a bed of roses with a dark brushed bronze base finish and lighter bronze highlights. The tiffany glass wings are expansive, so to ensure safe shipping, they are packed seperately in the same box. One screw easily attaches the wings to the base in seconds. Straighten the antennae and you have an accent lamp that will last a lifetime. Our occasion cards and gift wrapping are always included free of charge. 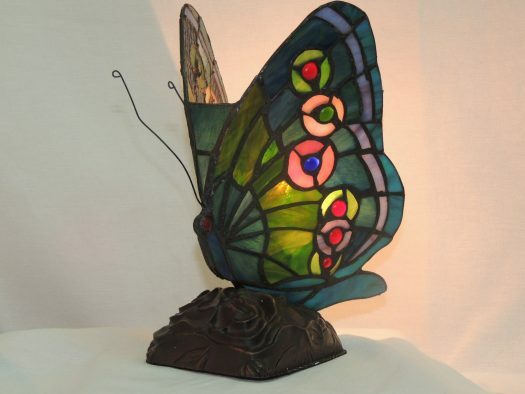 This stained glass butterfly lamp is 6 inches wide and 9 inches high. 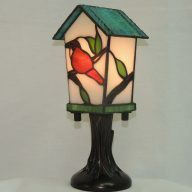 A maximum 25 watt bulb can be used in this lamp and is included.